Yacht Club Vodka starts with wheat milled into flour at a gristmill in the Northeastern region of France. Gluten is removed from the flour by adding water and kneading the dough to create a “gluten-free” base. The dough is dried, ground, fermented and then distilled. The removal of gluten makes the alcohol lighter in taste since there are less “congeners” (impurities) during the fermentation and distillation process. The alcohol is distilled five times and filtered through charcoal columns. Spring water sourced from the French Alps is filtered to 0.45 microns and added to the base alcohol. The result is a light, crisp tasting, gluten-free vodka, with a hint of Elderflower at the finish. Perfect on the rocks or in your favorite cocktail. 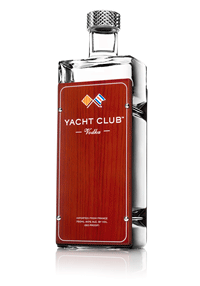 Inspired by life on the Côte d’Azur (French Riviera), the Yacht Club Vodka bottle takes you on a journey back to a time of simple elegance. Based on the look of a 1960’s Riva “Aquarama,” the legendary boat of the Riviera, the mahogany clad bottle is a handcrafted work of art. Custom glass blown in France, complemented by chrome hardware from Belgium, makes the nautically inspired vessel a handsome addition to any bar or yacht.